On 18 October 2017, School of Diplomacy faculty and students attended the Global Leadership Dinner at Gotham Hall, New York City. Global Leadership Dinner is an annual event organized by the United Nations Foundation (UN Foundation) and the United Nations Association of the United States of America (UNA-USA) in order to promote the UN leadership and recognize those who play an important role in promoting the UN values across the international community. The list of the speakers included: Larry King, Ted Turner, Kathy Calvin, Antonio Guterres, Magnus Groth, Robert Wells, Chris Whatley, Rachel Pittman, Daniel Craig, Elizabeth Cousens, and Kofi Annan. It was especially inspiring to see our own Dean Andrea Bartoli speak on behalf of the School of Diplomacy and International Relations and Seton Hall University. Dean Bartoli highlighted the efforts the School of Diplomacy puts in place to promote students’ participation and involvement in the United Nations events. 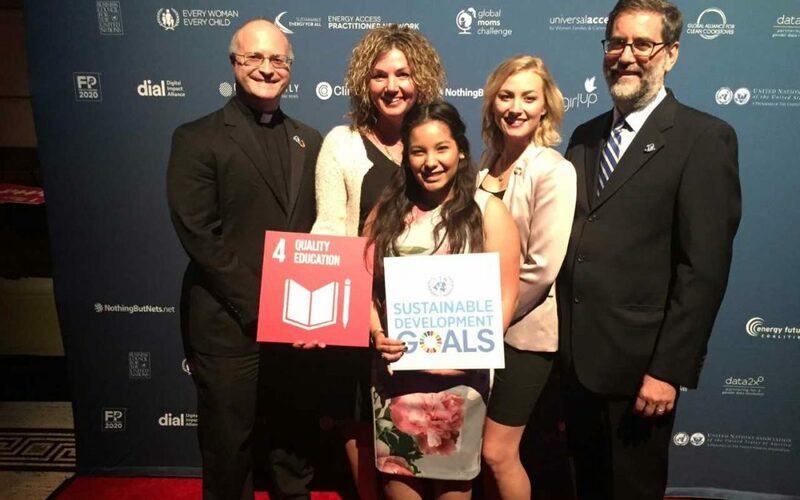 He emphasized the importance of engaging students in global actions and invited Secretary-General Antonio Guterres to visit Seton Hall University. The theme of the evening could be described as the unity of the global community, shared interests, generosity, passion and engagement. Every speaker talked about the need to work together in order to address the issues of our global community. The need for partnership and leadership were also emphasized. TV host, Larry King spoke about the moment in history of the United Nations when Ted Turner announced his decision to donate $1 billion in support of the UN values and initiatives around the world. Ted Turner, Founder and Chairman of the United Nations Foundation spoke briefly about that historic day. The United Nations Secretary-General Antonio Guterres, greeted the audience and spoke about the need for the United States to renew its leadership commitments in helping other countries cope with various issues. 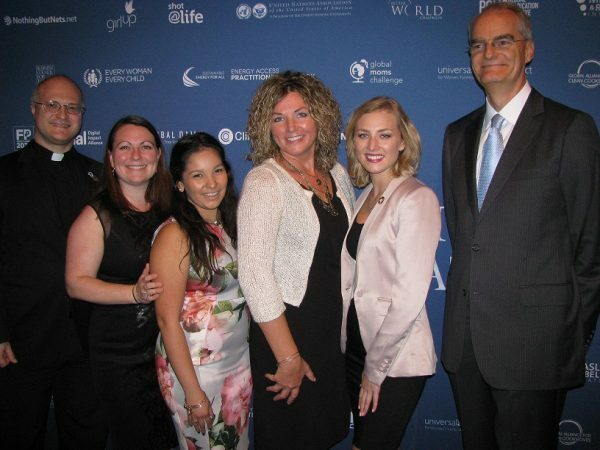 Kathy Calvin, the President and CEO of the UN Foundation gave a Global Leadership Award to Mars, Inc. While accepting it, Grant F. Reid, CEO and President of Mars, Inc., reflected that this award recognizes the work and commitment that the Mars, Inc does globally in supporting and promoting the UN values and initiatives across the international community. Munira Khalif, US Youth Observer to the UN presented a Global Leadership Award to Ellie Goulding, who said that the UN inspires her to be a global citizen and use her platform to promote the need to protect our environment. Chris Whatley, Executive Director of the UNA-USA together with Rachel Pittman, Senior Director, Membership and Programs UNA-USA made an introduction to the recipient of a Leo Nevas Human Rights Award, Senator Bob Corker. He could not personally be present at the Global Leadership Dinner, but accepted his award earlier from Kathy Calvin in Washington, D.C.
Daniel Craig, an actor and a UN Global Advocate for the Elimination of Mines and Explosive Hazards, presented a Global Leadership Award to Agnes Marcaillou, Director of the UN Mine Action Service. Elizabeth Cousens, Deputy CEO of the UN Foundation introduced Kofi Annan, former UNSG and currently a Board Member of the UN Foundation, who presented the Champion for Global Change Award to His Highness the Aga Khan. Kofi Annan praised Hi Higness the Aga Khan’s global efforts for peace and development over 60 years. Kofi Annan joked that 10 years of being a UN Secretary-General was enough for him as a global leader. This remark made the audience laugh. From left to right: Rev. Brian Muzas, Ph.D., Associate Dean Elizabeth Halpin, Noelle Sorich, Vera Dimoplon, Morgan McMichen, Professor Hugh Dugan.